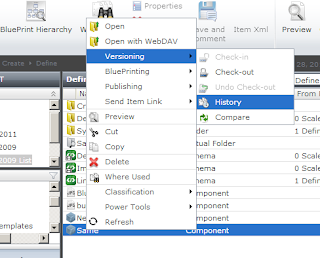 Disruptive Innovator: How Do I Revert Back to a Previous SDL Tridion Item's Version? How Do I Revert Back to a Previous SDL Tridion Item's Version? Sometimes you want to go back to a previous version of an item (page or component) in SDL Tridion. Here are the steps for your content editors. 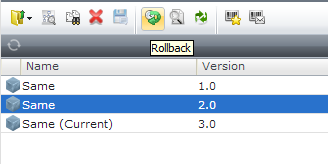 Click on an old version in the pop up and select Rollback. I prefer to keep old versions and do a “roll forward” by choosing to create a new version. But you can delete the other versions if you’d like. Consider talking to your IT contact about the Purge Tool if you notice lots of unnecessary versions while you're at it. Select Rollback and you’re done! The Content Manager item is updated to that previous version. Be sure to see it still makes sense in the context of other components, double-check the content, and update any links, especially if the previous version relied on items you've since changed (e.g. a linked component might have been deleted). Oh, and don't forget to publish your changes. For techies: for delivery-side undo, stay tuned to community and official information on SDL Tridion 2013’s Bundle Workflow features. For bloggers: this update comes from a real-life customer question. I'm saving future me's time by sharing it here. I saved past me's time by making most of this via an email post.